The 2018 1 oz Silver Isle of Man Noble proof coin is a worthy addition to any collection and it's sure to be one of the year's 'not to be missed' releases. 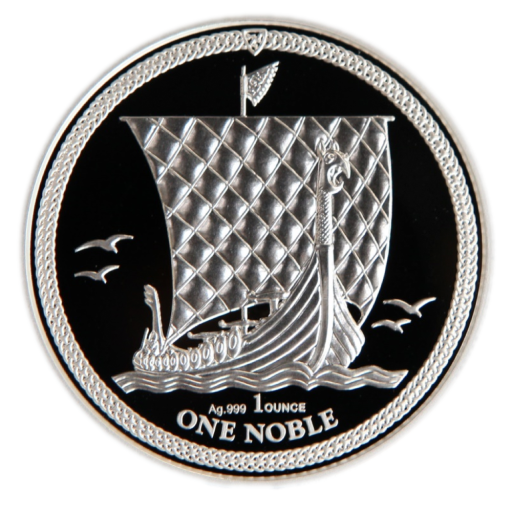 Demand will be high, as it is for any successful silver coin - beat the rush by ordering your 2018 1 oz Proof Isle of Man Noble today with coininvest.com. Manx bullion coins are adored by numismatics for their outstanding design features and limited mintages and the Noble is one of the most popular. The proof version of the 2018 1 oz Isle of Man Noble is struck from one troy ounce of shimmering .999 pure silver and each detail is exceptional. Proof coins of this calibre allow collectors to enjoy remarkable designs in stunning detail. The Isle of Man is part of the United Kingdom although it has its own parliament and coinage. Located between Scotland and Ireland and north-west of the English coast, the island was a popular port of call for ancient Viking raiders. The reverse of this striking silver coin shows the famous Viking long ship 'Thusly' in sail; each shield is beautifully outlined, the prow dominates the foreground, sail details stand out, and the premium-grade finish offers a higher level of contrast between the design and the background. Isle of Man Silver Nobles are always snapped up quickly and only 15,000 of this exquisite 2018 1 oz proof edition will be issued worldwide. Don't miss the chance to own the 2018 1 oz Isle of Man Noble Silver Proof coin. Order today with CoinInvest for fast, insured shipping. Although coins are shipped in individual capsules, you can add one of our specially designed display cases to your order to show off your Proof Isle of Man Silver Noble to perfection while protecting it from inadvertent damage.